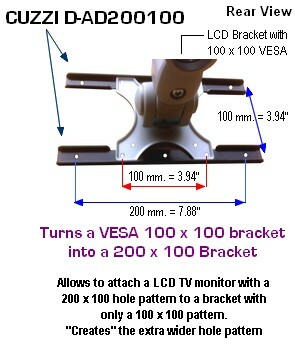 This is an adapter that allows you to attach an LCD monitor with a 200 x 100 VESA mounting hole pattern to a monitor bracket which pnly comes with a 100 x 100 VESA hole pattern. 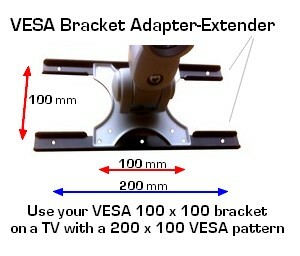 Also known as a VESA adapter-extender 100x100 to 200x100. If your LCD monitor is around 25 - 30" in diagonal width, it is quite probable that it has a VESA 200 x 100 mounting hole pattern. What is this? It refers to the 4 mounting holes on the back of the monitor, which form a rectangle, where the distance between the left holes and the right holes is 200 mm (left to right) and the distance from the top hole to the hole immediately under it is 100 mm. If this is the case, a "200 x 100 VESA bracket" is required. 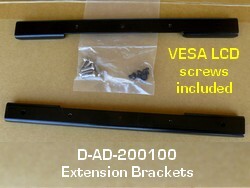 Therefore, you can "widen" this bracket with this D-AD-200100 VESA hole adapter. 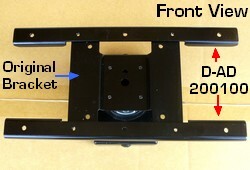 As shown above, this adapter is attached onto your existing bracket's 100 x 100 hole pattern. First, you attach the 2 adapter braces to your existing monitor bracket, thus widening the reach of the brackets holes to 200 mm. Then, simply attach the TV to the matching holes in the adapter. Before buying this adapter, you must be sure that your existing LCD bracket can hold the weight of the screen you will be attaching to it.